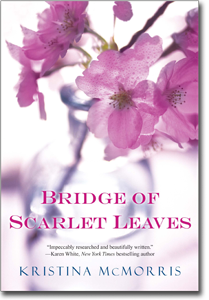 The Bridge of Scarlet Leaves was truly fantastic but to be truthful I found it difficult to really sink in to at first. I’m not sure if this was because I was confused by the introduction of the characters or if I just had a hard time connecting them to each other. It didn’t take long though for me to fall in love with Maddie and Lane and it was only a few chapters in before I desperately wanted for everything to work out for them when everything seemed set up for them to fail. One thing I found really interesting was the tiny, seemingly insignificant, fact that McMorris didn’t have parental figures for Maddie and her brother to lean- it made the conflict at the start of the novel very easy for anyone to understand. As their mother had been killed in a car accident and their father had been unable to communicate since her death, TJ was trying to become the father figure and ensure Maddie’s reputation. Maddie meanwhile was trying to hide that she was dating TJ’s best friend Lane- who also happened to be Japanese-American. Maddie and TJ pulled away from each other rather than came together and this created a natural rift in their relationship. This of course led to Lane and TJ also losing their friendship. Instead of supporting each other they pushed each other away and this led neatly to the rest of the story. The time period is fascinating to me and I found that I was really hungry for details of the detainment of the Japanese during WWII. I didn’t really know much about it, except that it happened, and I think the author really intertwined it well with the love story without lessening its importance in history or making it so heavy with detail that we lost sight of Maddie and Lane. I loved the details given about Lane’s family- his mother, sister and even his father were special to me. Be warned that a portion of the second half of the Bridge of Scarlet Leaves has some difficult passages to read, so between the joyful moments there were a few things I had to force myself through but McMorris is certainly a talented writer and I enjoyed this novel so much I couldn’t put it down. Thank you to Kensington Books for our review copy! All opinions are our own.